The meibutsu Nikkari-Aoe had originally a blade length of 2 shaku and 5 sun (~ 75.8 cm) but was later shortened to the present-day nagasa of 1 shaku 9 sun and 9 bu (~ 60.3 cm) which makes it in terms of sword nomenclature an ō-wakizashi (大脇指), a large wakizashi. On the tang there is the gold-inlayed name of its past owner but parts of this kinzōgan-mei are lost due to the shortening. The remaining signature reads “Hashiba Gorōzaemon no Jō Naga…” (羽柴五郎左 衛門尉長). Hashiba was the self-chosen former name of Toyotomi Hideyoshi when he was a retainer of Oda Nobunaga. The name Hashiba (羽柴) is actually a composition of two characters of Nobunaga´s most famous generals, namely Niwa Nagahide (丹羽長秀, 1535-1585) and Shibata Katsuie (柴田勝家, 1522-1583), together pronounced as “Hashiba.” This was not a pure playing around of Hideyoshi but a clever tactic because so he was able to secure the goodwill of two of the most powerful military leaders of his time. Well, but who is now meant with “Hashiba Gorōzaemon no Jō Naga…”? – Niwa Nagahide´s common name was Gorōzaemon but the family name Hashiba can not be applied to him because he himself was the name patron for this conglomerate. So we come to his oldest son and heir Niwa Nagashige (丹羽長重, 1571-1637) who inherited together with the headship of the famlily also the common name from his father. In the 15th year of Tenshō (天正, 1587) he participated in Hideyoshi´s campaigns against Kyūshū but was punished because of inappropriate behaviour to one of his retainers. At that time such a punishment meant basically a transfer to another fief with a lesser income. From the large amount of 1,230.000 koku from his father´s provinces of Echizen, Wakasa, and Kaga, only 40,000 koku were remaining in his new Mattō fief (松任, present-day Ishikawa Prefecture). We can now speculate about the shortening of the blade. First we can say that Nagashige had inlayed his name on the tang after he had received the sword from his father and second, that the blade had then already been shortened from 75.8 to 60.3 cm. That means it is possible that Nagashige himself had the blade shortened for whatever reasons – maybe it got damaged towards the base – and subsequently added his name on the tang. Also unclear is the second shortening that took place, i.e. when the tang was cutted a few centimeters right after the character for Naga. The most easiest assumption is that the blade was shortened to the desired blade length regardless what was written on the tang. This practice was very common and also the adding additional peg holes was handled not particularly demurely: In many cases they go mercilessly through characters of the signature. Another reason for the shortening could be that the blade came into the possession of a wealthy merchant because except the bushi class now one was allowed to wear a blade measuring more than 2 shaku (~ 60.6 cm). Often this was pushed to its limit, i.e. to the last millimeter, and nouveau riche merchant class openly displayed their cultural and financial catch up to the warrior class with wearing high-ranking swords and fittings. But this is a theoretical thought because the sword was continuously in the possession of the Kyōgoku family (京極), more about that later. A third option for the shortening of the tang up to the character for Naga could be that the then owner tried to erase Nagashige´s name and instead allude to Nagahide as previous owner. As mentioned, Nagashige was transferred for disciplinary reasons and when he sided with Ishida Mitsunari at the Battle of Sekigahara he ended in ruin and as impoverished rōnin (浪人). Well, three years after Sekigahara he was again given a fief with an outcome of 10,000 koku and after participating at the Ōsaka campaigns at the side of the Tokugawa he again gained reputation, but in contrast to his father, his „career“ was regarded as fail by many of his contemporaries. So maybe the owner tried to erase his name from the sword as mentioned above. However, regarding the nickname Nikkari-Aoe, three different traditions exist. First I would like to present the version of the Kyōhō Meibutsu Chō. We are in the early Azuchi-Momoyama era (安土桃山時代, 1568-1600). In the Gamō district (蒲生) of Ōmi province there was rumour about a demon stroke terror around the local Mount Hachiman (八幡山). Lord of these lands was Nakajima Shūridayū (中島修理大夫) and he was forced to act. So he – other traditions say it was his brother Kuridayū (九理太夫) – went to the mentioned area. On his belt he wore his sharpest sword, a blade by the Aoe school from Bitchū province. The forrest became more and more dense and night came in. Suddenly Nakajima encountered a women with a child in her arms. She sat the kid on the ground and asked with a gauntly grin if the honourable man would pick up the small children. When it crawled towards him he immediately thought by himself: “A woman with her child here in the deep forest and at that time, this is quite odd and the demon must be involved in this!” He drew his sword and cutted down at the kid but then the woman laughed the more gauntly and approached him: “Then you should hold me in your arms instead!” But Nakajima gave her a short shrift and cut down in a straight blow whereupon both of them, the woman and the child vanished. The next day Nakajima tried to get to the bottom of this matter and hurried to the place where everything happened last night, assuming that two bodies must be there. But instead of them he found two mossy stone lanterns (ishidōrō, 石灯籠, see picture above) whose upper parts were lying on the ground nice and neatly severed. “So that must had been the demon? !” he thought by himself and returned home, whereupon he gave the sword the nickname Nikkari-Aoe. Nikkari (にっかり) or also nikkori (にっこり) means “grin, sneer.” The second version of the story is found in the Jōzan Kidan (常山紀談), a collection of anecdotes compiled by the Confucian scholar Yuasa Jōzan (湯浅常山, 1708-1781). The main protagonist of this tradition was a retainer of Asano Nagamasa (浅野長政, 1547-1611). As stated in this story, Nagamasa on his side was a retainer of Toyotomi Hideyoshi and was granted with the districts Kōga (甲賀) and Kurita (栗太) of Ōmi province due to his long-standing loyalty and military achievements. The income of rice of both districts was 20,300 koku. One day this vassal was on the way from Kōga to the south-eastern province of Ise and had to cross the Suzuka mountain range (鈴鹿山脈). He had to hurry because it already got a dark. As Nakajima, he suddenly met a young woman. Sceptically he stopped and addressed her but the women just grinned in a fearsome manner whereas he drew his sword and cutted her down. With a loud plump her head felt to the ground. The next morning he looked for the place again to examine where she had been but was only able to find a stone statue of the deity Jizō (地蔵) which are frequently seen at the wayside – the head of the statue lying to the side in the grass. So he gave the sword the nickname Nikkari-Aoe. And the third version goes back to the tradition of the Kyōgoku family. It deals with a certain general Koma Tango no Kami (駒丹後守 or 狛丹後守), commander of the tenth battle line (jūban-zonae, 十番備) of the Sasaki family (佐々木). One night Koma was on the way in Ōmi´s Gamō district near the village of Chōkōji (長光寺) when he encountered a female figure. Because she was smiling Koma approached her but as it turned out that she was a shapeshifted demon he too drew his sword and killed her with one single blow. Of course, he called his sword Nikkari-Aoe after this incident. But now to the historical facts. Oda Nobunaga entrusted Shibata Katsuie in the first year of Genki (元亀, 1570) with the defense of Chōkōji Castle (長光寺城) because Rokkaku Yoshikata (六角義賢) who was introduced in this story was just on the way to reconquer it from Nobunaga. During the siege of the castle the one and only spring of Katsuie dried up and only three water jugs were remaining. Katsuie ordered his men to empty those jugs with in one go as if there´s no tomorrow and shashed them demonstratively. Egged by this “samurai-like” behaviour of their lord the men achieved a true victory and drove away the Rokkoku besiegers. Later Mt. Chōkōji on which the castle once stood was popularily called Kamewari-yama (甕割山, lit. “jug-smasher mountain”). Katsuie was officially installed as castellan of Chōkōji and when he heared of a legendary sword called Nikkari-Aoe going somewhere round in his lands associated with the castle he ordered that it shall be confiscated. He presented it to his son Katsutoshi (勝敏, 1568?-1583). But Katsutoshi had no luck with this sword when he participated at the age of 15*2 in the Battle of Shizugatake (賤ヶ岳) in Tenshō eleven (天正, 1583). The Shibata suffered a defeat and when his father committed seppuku the remaining retainers advised him to flee but he stayed and was captured and executed by Niwa Nagahide. And this was probably how the sword Nikkari-Aoe came as war spoils in the possession of Nagahide. Later the sword came into the possession of Hideyoshi who – being taken with the story behind it – had a special storage box made for it. Hon´ami Kōtoku´s records from about that time say that it then measured already only 60,3 cm and that the tang was cutted off right after the character for Naga. As mentioned before, the thougts about a shortening by a wealthy merchant were just theoretical but should nevertheless be quoted as a background information in which context such shortenings could have been carried out. 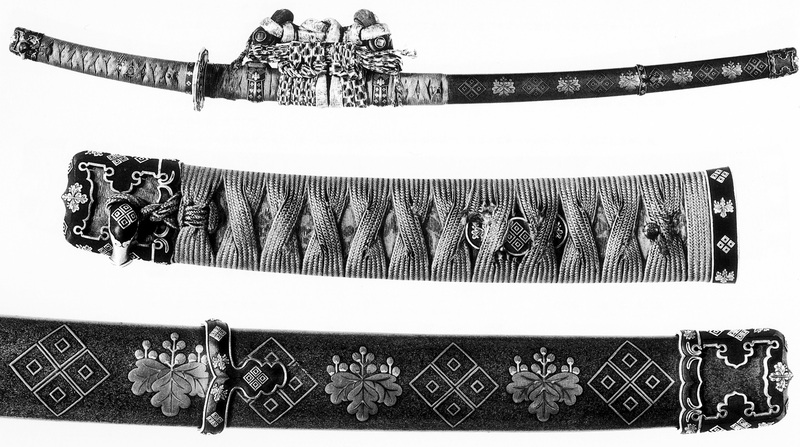 Hideyoshi´s son Hideyori had two mountings made for the blade, one of them can be seen in the picture below. The precise circumstances how the sword came into the possession of the Kyōgoku are not handed-down but it is most likely that the Nikkari-Aoe was once a present of Hideyori to Kyōgoku Takatsugu (京極高次, 1563-1609). Takatsugu´s successor, viscount Kyōgoku Takanaga (京極高修), received in 1940 the status jūyō-bijutsuhin for the blade. After World War II it was owned by a certain Aonuma Mitsuo (青沼光夫) but in 1997 it was bought by the city of Marugame (丸亀, Kagawa Prefecture on Shikoku) because the Kyōgoku were the lords of the Marugame fief of the same name. Since then the Nikkari-Aoe is preserved in the Historic Archive of the City of Marugame. Nikkari-Aoe and one of its koshirae. *1 Jō (尉) was once the rank of a deputy official of the Imperial guard. Later, i.e. from the Muromachi period onwards, this rank was granted as a honorary title. *2 There are several theories about his year of birth and so his age at the time of the battle ranges between 14 and 16.